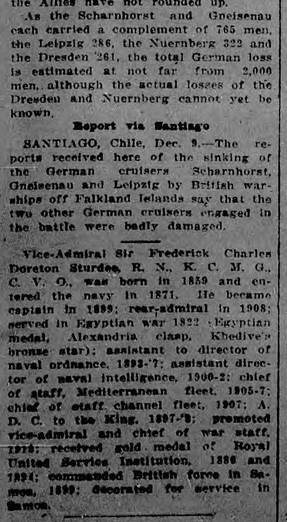 Three German cruisers sunk in naval battle near Falkland Islands. Forces from British India take Kurna, city at the confluence of the Tigris and Euphrates rivers, entire delta under "compete control" of the British. British casualties listed as "one British officer killed and three wounded, with forty Indians of the rank and file killed and 120 wounded." 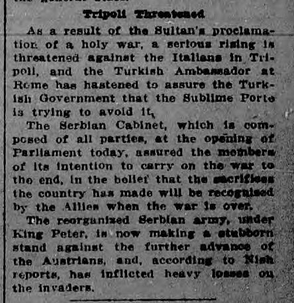 Second article "Cheerful News for the Allies" restates the naval and Persian Gulf victories, continues with stability of Flemish lines, Russian strategic retreat from Lodz, and Arabs threatening Tripoli. 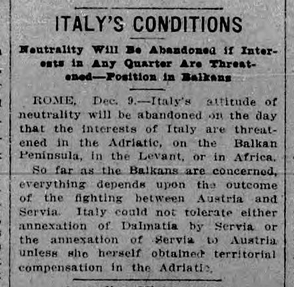 Italy draws a line in the sand: will "not tolerate either the annexation of Dalmatia by Servia [Serbia], or the annexation of Servia to Austria" unless compensated. Prince of Wales [future King Edward VIII] promoted to lieutenant. Picture of one of the German cruisers that was sunk. Unable to get supplies from France, Russia is looking to purchase munitions from Japan. Interesting little 2-line filler article "Russia requires all professional photographers to be licensed." 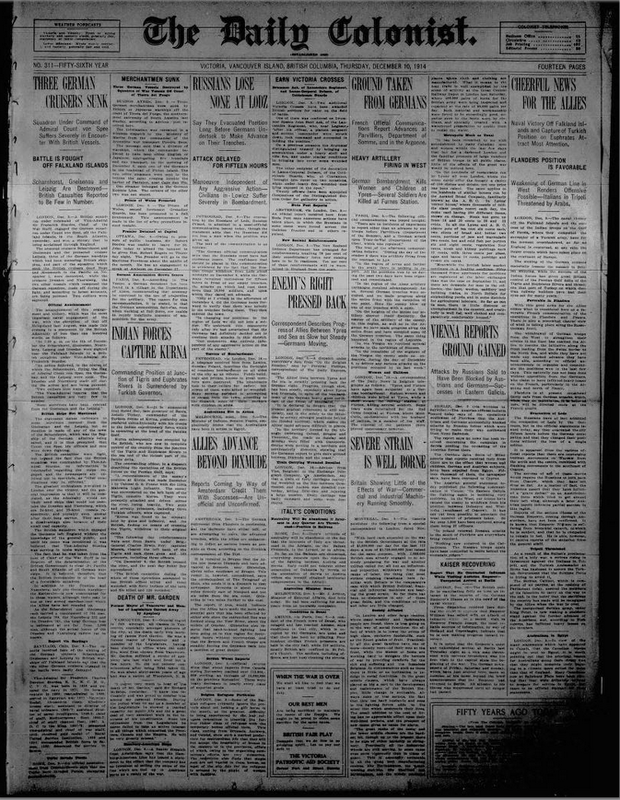 Provincial government revokes licenses of "no less than nine" clubs in Vancouver "conducted by Asiatics and incorporated under the Benevolent Societies Act" for gambling. Canadian actress Mary Pickford signs record-breaking contract with Famous Players for a $2,000/week salary.